Add Adsense In-Feed Ads Script in Blogger Site - XpertShout Yayın bulunmaktadır. 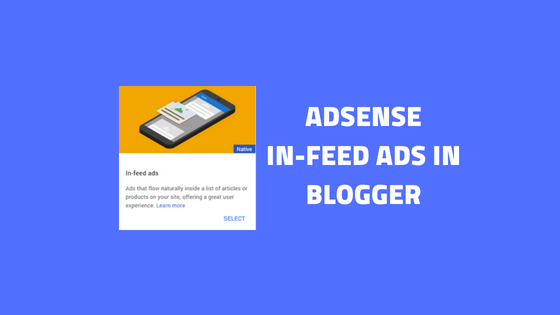 Most of blogger user doesn't know that how to add adsense infeed ads script in blogger. We all know that blogger is not like WordPress platform. Blogger is html based platform. This can not be easy for beginners to make changes in template editor. Only those people can make changes in blogger HTML whose have some knowledge of html not too much. Now come to the point that how to implement adsense infeed ads script in blogger site. First you should know what are adsense in-feed ads. What are Adsense In-Feed Ads? adsense in-feeds ads are those type of ads which are appear in between your blog post not inside the post. These ads are not like in Blog Post between ads. You can see demo in below pic. Adsense infeed ads are of four types like image above, image on side, title above and text only. Demo pic for all type of in-feed will be at end. in image above ads, image will be on above the post title and description. You have to select this ad with respect to your blog feed. in above pic, my blog feed is not like image above. So, i can't select this. these ads are like my blog feed. So i can select them. But i repeat you have to choose as per your blog feed. i also can select them but i think not will look beautiful. These are like image on side ads but the difference is here the title is now above on image. in these in-feed ads no image will be there. I not recommended to choose this one because without image ad may not give you better revenue. Now the important part is that how to add adsense in-feed ads script in blogger. Let see. Go to Blogger HTML Editor and search for </article>. Now paste in-feed ad script just below </article> and save template. same as in below pic.